Imagine pouring one and a half teaspoons of salt directly into your mouth. Can you taste it? Blah, blech! You’d shed an ocean of tears trying to choke down those tongue-tingling crystals. Yet, if you’re a typical American, you eat that much salt every single day. And that’s one primary reason why 50 percent of us are considered at risk for high blood pressure. I know, that sounds impossible—you seldom if ever reach for the salt shaker, right? Well, you don’t have to: Data from the Centers for Disease Control and Prevention show that most of us consume about 3,400 mg of sodium a day, but only 5 percent of it comes from home cooking. Some occurs in foods naturally, but the overwhelming majority of the sodium you eat—77 percent—comes foods sold in supermarkets and restaurants. 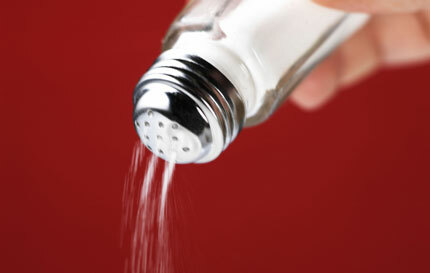 Heart disease is the number-one killer of Americans, and sodium is one of the primary culprits. We should be eating no more than 2,300 mg a day, and less—about 1,500 mg—if we’re at risk for high blood pressure. And yet, while researching my latest book, The Eat This, Not That! No-Diet Diet, I uncovered countless restaurant meals with one, two, even three days’ worth of salt in them. Think I’m exaggerating? Take a peek at the saltiest dishes coming from America’s kitchens. Somebody needs to tell Ruby Tuesday that to make “Mediterranean” pasta, you don’t need to actually boil the noodles in Mediterranean seawater. Ruby Tuesday makes only one pasta dish with fewer than 2,000 mg of sodium (almost an entire day’s worth! ), and it has only two pasta dishes with fewer than 3,000 mg. The other four pasta dishes on the menu each have more than 3,000 mg.
DID YOU KNOW? Grocery cart handles are dirtier than bathrooms, and half of them carry E. coli, says a new University of Arizona study. Discover shocking health, nutrition and weight loss secrets—and how to eat, drink and still shrink, without ever dieting!—by following me on Twitter right here or by signing up for our FREE Eat This, Not That! newsletter. IHOP is another chain known for egregious sodium levels. Even foods that sound relatively sodium-free are swimming in the stuff. Take an order of Buttermilk Pancakes. One order—5 pancakes—has 2,640 mg sodium. Things turn especially ugly when you start adding meat to the plate. You’d be wise to avoid any dish with steak or ham, which consistently contribute to a total of more than 2,000 mg per dish. Bonus Tip: The right breakfast will make you super-productive. So avoid the wrong ones, especially these shocking 20 Worst Breakfasts in America. Avoiding salt at Applebee’s is nearly impossible. Not even the “healthy” selections pass muster. The six items on the Under 550 Calories menu average 2,341 mg of sodium per entree. The five items on the Weight Watchers menu average 2,448 mg. Even the side dishes are dangerous. A side of Loaded Mashed Potatoes will cost you 1,340 mg, and a side of Broccoli Cheddar Soup will cost you 1,690. If you order anything off this menu, you’d be wise to stick to sodium-free foods for the rest of the day. DID YOU KNOW? Studies show that people underestimate how many calories are in restaurant meals—by nearly 100 percent! Think you know healthy foods when you see them? Then I’ll bet you’ll be shocked by these 25 ‘Healthy’ Foods That Aren’t. Restaurant appetizer samplers are notoriously riddled with sodium, but Applebee’s is a full-blown tour de force of heart-stopping potential. Piled onto this plate are a bacon and cheese quesadilla, fried cheese sticks, spinach and artichoke dip and chips, and boneless buffalo wings. Just one of those things is bad enough, but add all four and you have three days’ worth of sodium and more than an entire day of calories—in just one appetizer! DID YOU KNOW? You don’t need to make big changes to your diet to lose 10, 20, or even 30 pounds. You just need to make the right small tweaks. Change how you look and feel—fast and forever—with the 25 Best Nutrition Secrets Ever! PF Changs’ menu is probably the saltiest in America; even a bowl of Hot and Sour Soup has 5,000 mg. For that half of the population that’s supposed to max out at 1,500 mg daily sodium, the Double Pan-Fried Noodles with Pork harbors more than five times the limit. Even for those in the higher tier, it still represents three-and-a-half days worth of sodium consumption. If you end up at Chang’s, let the Steamed Buddha Bowl be your safety plate. But remember: It’s got to be steamed. Order it stir-fried and the same dish suddenly leaps to 2,740 mg sodium. Yikes.